The church is not here to take the place of professionals; we are not here to be the doctor, psychiatrist or chemist. We will sometimes counsel people, but not necessarily in place of a professional counsellor or psychologist. Our role as a church needs to be the place that offers radical hospitality, hope and family to those who are often marginalised and stigmatised – just as Jesus modelled. But what does it look like to offer this today? Looking at the biblical narrative of hospitality, we see a story of welcome and inclusion. In Genesis we see that all are made in the image of God. Old Testament prophets such as Amos and Isaiah had an outward focus on justice and a provocative call to make space for others. Jesus spent his ministry breaking down the social norms and including those that ordinarily would have been on the outside. This is seen in the people he spoke to (the woman at the well); the people he healed (the 12 lepers) and his choice of disciples (tax collector, fishermen, not the educated teachers of the faith). His painful death on the cross was the ultimate sacrifice; it was allowed by God in order to bring all into the family of God. And then he called on his disciples to go and do likewise. The early Church in Acts was a place where wealth was brought and distributed to those who needed it. This was about more than the occasional bring and share ‘faith meal’; it was radical, counter-cultural and a remarkable witness to society. Everyone was welcome to be a part of it. This is the example Jesus set us, and it’s the standard we need to follow in welcoming in those with mental health problems. How, though, do we follow this example? Let’s imagine visiting a house, as a metaphor for exploring a journey of inclusion in our churches. Here, hospitality and welcome are found in three distinct stages. Consider a home you know, perhaps one where you have felt increasingly welcome over time. Picture the front door, the living room and the kitchen. How does each space make you feel? At the front door, once the bell is rung or the knocker knocked, the door is (hopefully) opened and an initial greeting is made. Were you – the visitor – invited, or have you another reason to visit? Generally a facial expression, or the extent to which the door is flung open, reflects how pleased the host is to see you. As a security chain is removed or the door is pushed further open, so the visitor sees more of the house, perhaps smells what’s cooking. The host is actively removing a first barrier and opening up to a level of vulnerability – an intentional welcome. If we do not want to speak to someone, we do not open the door. Do our churches often have unwritten rules about who’s allowed in and who we would rather not be troubled by? Perhaps our mix ethnically, socially, generationally – or a culture of only really valuing successful, professional ‘got life together’ types – can be overwhelming to new people. Let’s take it for granted that in the 21st century in the UK, we don’t explicitly tell certain people to stay away from our church communities. However, the more subtle exclusions described here can of course be harder to address. We need to intentionally make it known that those with mental health problems are as welcome as anyone else. That it’s ok to be real about our mental, physical, emotional or other challenges is a message we need to both speak creatively and demonstrate lovingly. By talking with those in our congregation who suffer from, or are affected by, mental health problems, we can learn what barriers they encounter. This conversation, in and of itself, demonstrates an intentional act of welcome. It conveys a willingness to engage with the subject and a desire to include everyone in the life of our church. In turn we learn how to unlock the front door, how to make the bell more accessible or even to show where our door is in the first place. Once the front door is open, the host chooses whether the visitor should be allowed further in. Next on the journey of welcome is the living room. This is the space where we begin to develop and deepen relationships; it’s a safe place for us to sit down and have time and space to become more aware of each other. The living room probably has personal photos, books, CDs and other physical objects that reveal more about our host. The visitor and host begin to find common ground: points of connection or interesting points of difference. Both the offer and acceptance of the invitation into the living room represent a deepening trust. However, whether the home is a six-bedroom detached house or a one-bedroom flat, the living room can often be a place kept especially tidy and presentable for visitors. It’s a place the host doesn’t mind people seeing – and in fact the photos, books and CDs may well have been chosen with a consideration about what message they reveal to others. This is not a sign of someone being unwelcome, and nor does it imply a falseness. It’s simply still an early level of relationship where we are generally more cautious about how we present ourselves. However, if the hospitality takes the form of leaving someone in that living room – in that Sunday service – then it’s merely the hospitality of distant friends, or friendly strangers. In our churches, we need to move beyond the Sunday services and the formal gatherings to connecting during the week: a text, a cup of coffee. This is where the welcome begins to feel rooted in something lasting and meaningful. The final stage in this metaphor is the kitchen. Once you truly know someone and have made yourself open to what they can contribute, the kitchen becomes the place you can share in activity together. Not only is there space for conversation, but the host and guest can together prepare a meal, wash up or in other ways be genuinely side by side and fully engaged, participating in relationship together. Differences here, nervousness around the comparable levels of emotional or mental health, are laid aside as people ‘do real life’ together. The visitor isn’t looking into the life of the host from the outside, but fully accepted and included at the centre of the home. Angels: this is the ‘wow, they are lovely’ stage; we enjoy getting to know someone. It’s early days and we see all of the potential in them. Demons: the honeymoon period ends as we get let down, frustrated or upset when our – perhaps unrealistic – expectations aren’t met. The relationship has progressed, but the sharp edges begin to rub against each other. Humans: this is the point where we acknowledge ‘I’m not perfect either’. We recognise that actually we all have excess baggage and whilst the other might have different baggage from us, we’re beginning to see the Angel and Demon together, the good and the bad. At the Human stage we may begin to drift apart unless we decide to fully accept and love these differences. Family: the ‘lets grow and journey together’ stage. This is the point where we’re going deeper into relationship, aware of their baggage as they are aware of ours. We become defined by what truly unites us, more than the labels that so easily get stuck upon us. 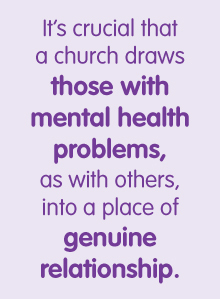 It’s crucial that a church draws those with mental health problems, as with others, into this place of genuine relationship. This need not mean that everyone has this relationship with everyone else in church. However, we must recognise that those with mental health issues are as much a part of God’s creation as anyone else. This needs to be what we are striving for. The role of the church is to be radical in its inclusion of those with mental health problems. 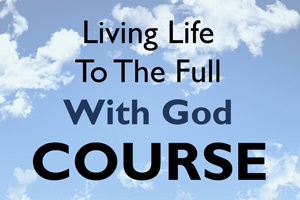 It is to make the community livable again for those who have felt rejected and stigmatised due to their ill health, and it is to reflect God’s character, in welcoming all to our table.